Slightly thinner than I thought but Great comfort and shipped fast...#AffordableToo!!! Find the blissful slumber you have been looking for with this wonderfully soft and supportive foam mattress. Memory foam is design to respond to every movement and pressure point for optimum comfort, gifting you with a quiet and restful night's sleep you can look forward to every night. After reading the reviews where people said it arrives in a box that was 4'x2'x2' I was a little skeptical. I was worried it would affect the quality of the matress. I lived alone, so when the package arrived the size of the box made it easy to move to my bedroom by myself. Matress was rolled up and packaged really tight, I cut the packaging and the matress instantly becan to expand. It was vacuum sealed. Within thirty minutes my king matress was 78"x74" which is 2 inches shy of what it is supposed to be in length and height. A day later it was the promised size. Mattress is very comfortable, not firm at all, its like laying on a cloud. I weigh 200 pounds and have no issues with this mattress at all. I have a platform bed and it works great. I would recommend it to anyone. I started buying the 7 inch foam mattress for the grandchildren's beds in my house. Then I bought the twins two 11 inch mattresses for their house. Now I have bought the full size 11 inch mattress for my own bed. It plumped up just fine with no odor and the first night I slept on it, I never even rolled over. Woke up flat on my back just like I went to sleep. And I slept until after 10 am. So comfy. Great quality, comfortable mattress for the price. My hubby and I are pleasantly surprised about how comfortable this mattress is. After a recent home purchase we bought this inexpensive mattress to get us by. It looks great and is extremely comfortable. We've had it for 5 months and it is holding up better than expected for the price. We are using a bed frame now but we had it on the floor for about a month before we were able to retrieve our furniture. We also had a 4 inch bed topper from our previous mattress but we found this one so comfortable that we removed it. I definitely recommend this, even on the floor but particularly with the box spring and frame. Ps. I didn't notice any strong odors, and my husband is very sensitive to smell and be didn't mention anything either. I comes in a small box. First thought....it doesn't look like it can ever be 11 inches thick....Once opened...it was full size within minutes. Length was spot on.... Great mattress. This thing in a little box expanded into a complete XL Full 10 inch thick. Pleasant surprise. Somehow I ended up ordering this 11 inch mattress rather than the 14 in Gel Memory Foam one and I am not happy with it! Spend little more and get the 14 inch one. It is ok but not as comfortable as the thicker one. I have the 14 inch memory mattress and very pleased with it. I just had a memory laps and got sold on the advertised description. I reviewed many mattresses before ordering this one for my 4 year olds new "big boy" bed. I am so impressed & excited how comfortable it is!!! He loves how he sinks in, but if you're looking for a firmer bed, this is not the one for you. Very soft, but stil supportive when I lie on it. No Smell when it came out of the package (I wanted to make sure if that) & it's made in USA and been tested for any harmful chemicals. Overall, a great mattress for a great value!! I was in desperate need of a mattress, when I priced one at the "big box" stores it was almost double the price of this one. The mattress took a while to arrive (11 days was a bit long.) The mattress is not too firm and the pillow top helps. I have noticed no smell coming from the foam, like other reviews of similar product have stated. Give it a good 24 hours before you sleep on it to return to it' pre-pack size and shape. Wonderful nights sleep after that!!! For the price I recommend this mattress. Was a little worried at how inexpensive this was, but this is perfect. Always had a box spring & spring mattress and when I needed a new one I was going to go the same route, but wanted to save some money. This, along with a very inexepensive metal platform frame turned out to be VERY comfortable. You might not have the firmness you're used to when sitting on the edge of the bed putting on your shoes and socks, but does have the best combination of firmness and softness for a great, comfortable bed! I bought the single mattress for my son who also has the same feedback. I'm 200 pounds, my son 220. I had some initial concerns with buying a foam mattress based on other reviews where I'd read true sizing was an issue (being shorter than actually stated). Admittedly, I went out on a limb when I decided to buy two, but I'm not at all sorry I did. Pleased sizing wasn't an issue since I paired these up perfectly with the Lunar Platform Bed I also found here at Overstock. I weigh 130 lbs so my beds aren't too hard or too soft. The pillow top really gives added comfort and is nice and thick. 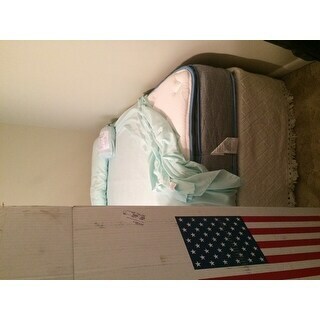 Both mattresses poofed right up to their measurements from their vacuum rolled packaging and were odor-free. The mattresses are covered in a decent fabric even though I've added my own covering to protect it. Shipping was fast, compact, convenient--perfect! Happy camper. I had a back surgery, which forced me to stay in a location for two weeks. Spent a lot of time in bed for recovery. I stayed with my mom, and she had this mattress in her guest room. It was great. I expected recovery to be awful and uncomfortable, but I slept so well, and was so comfortable days after surgery. I bought a queen and a twin mattress to go in my guest rooms. They showed up in the tiny boxes. We have a Tempurpedic in our master, and occasionally we will sleep a night in the guest room. They are that comfortable. Like sleeping on a cloud. Highly recommended! Very nice mattress. Quality of a much more expense mattress. Shipping was packed well with instructions for opening up the mattress. Weight about 50 lbs. Was shipped promptly. This replaced the factory mattress in our RV, which had only been used for a short time. This mattress is going to make RVing much better and rest will be peaceful again. Don't be afraid of this mattress it is an exceptional quality piece and made in the USA!! We needed a soft mattress for our son. He had just moved from a twin bed to a full and preferred a "soft and snuggly" mattress like the pillowtop we currently have. This mattress provided everything we needed for a much better price than anything we saw in any store. It shipped and arrived within a couple of weeks and was perfectly wrapped and packaged. Once unrolling and allowing to air out and fluff back up from being packaged it was the perfect size and filled our every need. We bought two of these for our living quarters at our barn and they are amazing. Our 6'5 240 lb son sleeps on this mattress and he said it's the most comfortable mattress he's ever slept on. I make it a practice to "flip" this mattress every week when I change the sheets, as I've noticed the "indention" of his body in the mattress. Flipping it from head to toe takes care of that and keeps it comfortable. The indentions work themselves out with the flipping and it goes right back to its' normal shape. We've been using these for well over 3 months now and they are holding up great. I have always wanted a pillow top mattress, but found them to be to expensive. I have been sleeping on a hard mattress purchased from Walmart which brought many sleepless nights and many aches from a hard bed. After sleeping one night on my pillow top, I was in love. This is the most comfortable mattress. No more sleepless nights, I would highly recommend this matter. It is not only comfortable, you don't want to get up when that alarm goes off. Very comfortable in our RV. Sleep extremely well. Best method for a physically limited person to compare,order,and especially the ease of sliding the small box into the house after delivery. Sliding the package out onto my folding frame was easy with the plastic wrapping guiding the placement as the compressed mattress rolled out and began inflating. When it was near full size I covered with mattress protector and sheets. I reclined on it for 4 minutes to rest my back but will wait til fully puffed before sleeping on it. The bed and mattress stores that deliver and set up beds with long return policies and years of guaranteed do not provide better quality material but do charge inflated prices for a fancy cover. Thank you for my new bed. I purchased this mattress for the guest room. It is so soft and comfortable! It was easy to open and you just let it sit for 24 hours to inflate. This mattress is excellent. Bought for my son's room. I almost switched mattresses with him since this one is so comfortable. When I'm ready for a new mattress I will be buying another one of these. I bought two of these in twin XL for our guest room. So comfy and good quality. They puff up after you take them out of the box. These are keepers. Everyone loves their comfort and quality! Our kids love this mattress....we have now ordered 2 and looking to order another one in the near future. It is so comfortable and the kids wake up feeling rested! This is another item that shouldn't be purchased sight-unseen or tested. Its okay, but not as comfortable as anticipated. I bought this to go on a brand new hospital bed. The mattress that came with the bed was hard as a brick and all the reviews I read on this mattress said it was really soft. It is a lot softer than the previous mattress but the pillow top squares made it feel bumpy and uncomfortable to sleep on. This was easily solved with a topper that covers over those bumps giving me a smooth surface to sleep on. Now the bed is comfortable for both sleep and lounge time. I would recommend it because the price is great for the mattress but just be warned you may want some sort of memory foam or gel topper. Update: After having this mattress for just under 3 years it has a huge indent in the center where I sit to watch TV or use the computer. I have never had a mattress break down like this, especially this soon. "I am purchasing a mattress for a seasonal camp. I do not have access to the camp for 4 weeks and the delivery of this mattress will take 1 week. Will the mattress be ok if I do not open it for 3 weeks? It says to unroll it from the package within 72 hours. Should I wait to order it?" he mattress will be fine left in the package for up to 90 days. "Is there any memory foam in this mattress? The description is unclear." There is no memory foam in this model. "is this mattress returnable? If so, how do you return if it came vacuum sealed?" "I purchased the Lucid Cotton Terry Mattress Protector along with my Nu Form Quilted Pillow Top 11 inch Mattress and was wondering if there was any problem with the fit before I open the mattress protector. My mattress came in yesterday and can’t wait to use it!" "I've never seen a full-XL mattress, do they sell bedding and frames for this size?" Yes, you can find bedding and frames for Full XL. "What is the weight of the standard queen mattress?" The weight of the mattress would be approximately 65 lbs. "Do you have a twin mattress and box spring?" This is currently available in a twin size.